Ethics was an early thought. Performing animals raises all sorts of uncomfortable associations. The dolphins we saw – Helen and Hannah – were rescue dolphins. They’d been found badly entangled with nets, and when they were recovered, were judged to be unreleasable back in to the wild. Research with the captive dolphins helps inform dolphin protection efforts in the wild. The space they were in was smaller than the ocean, but they had plentiful food and rich social engagement (including with the human trainers). And it was so hard to resist anthropomorphising: they really did look like they were having a good time. I got talking to the trainers afterwards. They were much better at not anthropomorphising – probably because they have more practice. They talked a lot about how the dolphins are very much individuals, with different personalities, dispositions, skills, and learning aptitudes. One dolphin will learn something really quickly; another will struggle and never really get it. They might do something really well one day, and then get nowhere the next. And sometimes they get in a mood and just try anything to get a rise out of the teacher. This all seemed very familiar from teaching humans. Their main approach to teaching is operant conditioning using only positive reinforcement and extinction (ignoring) – i.e. no punishments. The give the dolphins a reward (fish for tricky things, hand rubs and excitement for more everyday stuff) for behaviours they want to encourage, and ignore behaviour they don’t want to encourage. They joked about using this approach more widely, with people, and I think they were only half joking. 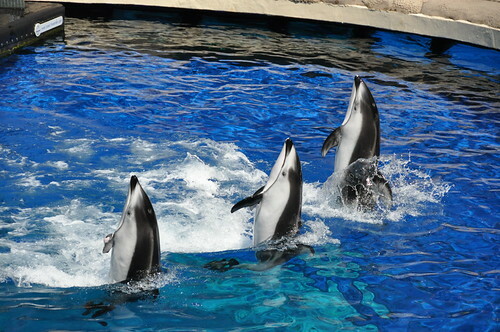 They also talked about the importance of spending a lot of positive time with the dolphins without doing the training/rewarding stuff, so the trainers aren’t seen only as a source of food. To build up to a complex behaviour – e.g. tail walking forwards and backwards – they use successive approximation. They start with a natural behaviour (the main starting point) and reward the dolphins for getting a step closer from there to the final goal. So they started with getting the dolphin to come up out of the water to touch the trainer’s hand with their nose. Then transfer to a white ball on a stick, which gets raised higher and higher. The motion of the tail to keep them up out of the water tends mechanically to get them to move backwards, so they can reinforce that, and so on. 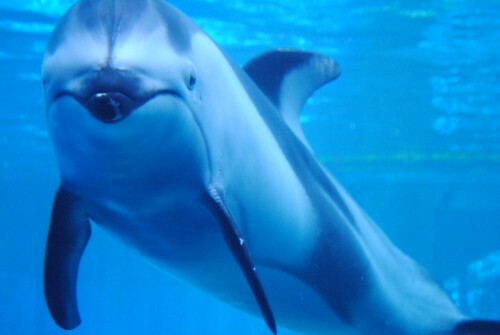 They have a high-pitched whistle (audible by humans but from the sound I suspect it’s much louder if, like dolphins, you can hear higher frequencies); this acts as a ‘bridge’: the trainer gives the signal to the dolphin, then blows the whistle when they do what the signal means, so the dolphin gets immediate feedback that this behaviour is ‘correct’ and will lead to a reward. I was fascinated by the signals. The trainers talked a lot about how they didn’t have a shared language. But I think they did: it was a very basic, pidgin of a language, with precious little grammar, but they were communicating. The signals – from trainer to dolphin and back the other way – emerge as a joint construction by the two. At one level this is just operant conditioning; I don’t want to overclaim. But there seemed a lot of similarity between how the communication between the trainers and dolphins developed and, say, how babies and parents can develop a shared sign language. Some signs are really obvious – circling finger for ‘spin in the water’, or both arms up in the air for ‘parent pick me up’, but others seem almost entirely abstract signifiers that only have a shared meaning because of the shared history of usage. The sort of learning I’m interested in helping to foster, and have been talking about at LAK12, is a much higher order than what the dolphins were doing. But it’s worth paying attention to the basics. It’s easy to forget the importance of simple things about fostering effective learning – like the importance of quick, positive feedback, and voluntary participation in the learning experience.